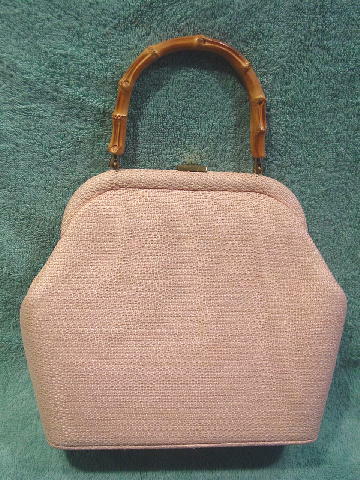 This vintage woven handbag has an 11" faux bamboo handle and is by M M.
The surface appears to be a mixture of straw and twine in a light peachy-pale pink with a touch of azalea. 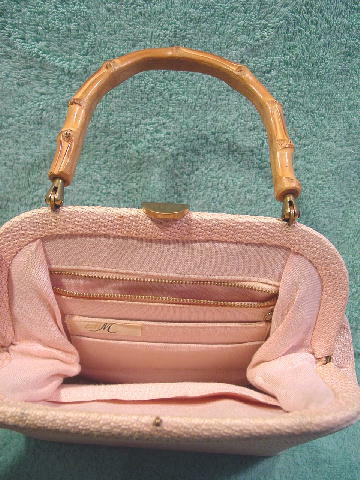 The interior has a light pink fabric lining with a large zippered pocket and two open sections in front of it. The front side has a large open pocket. The bottom of the handbag has four little metal feet. The color of the purse and handle are more accurately depicted in the second picture.